When children played with wooden toys, one of my favorites was the spinning top. A top is wound with a piece of string and then tossed so that when the top lands on the sharp end, it is spinning because the string is pulled. 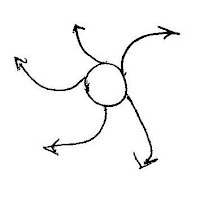 The dynamic center of a top is a point at the top of the top (or apex) where the centrifugal forces of spin appear to be most concentrated – they come from the center, outwards. 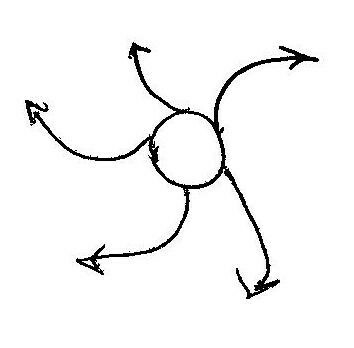 If we are the central point – the actor – then this situation is like a Lawn Sprinkler. We think about output, coverage. Keeping the spin of the top going, not falling over, what we have to put into our system. This is GOAL ORIENTED. But, life as we live it is not only what we do (output), it requires input – receiving and processing centripetal factors which come from outside us – from the periphery. The behaviors of others, the circumstances, of situations, our resources of health or wealth, the weather, etc. – lots of things are factors that come into play in our lives which we must process. Our thinking, feelings and intentions (willing). A lot. We receive more from the outside than we are able to generate from the inside. We are inspired in order to do things on the outside. These flows are built into our physiology as well. Our hearts operate on systole and diastole. We take blood in and blood is drawn out by our bodies. We breathe in (inhale) and breathe out (exhale). Our hearts sense what our bodies need. And our hearts sense feelings of one another. These feelings flow into and out of us all the time. We give to one another what we sense the other desires and we sense one another adjust to each other. 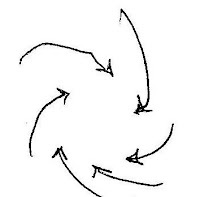 It is this drawing in of senses that sets up our response. 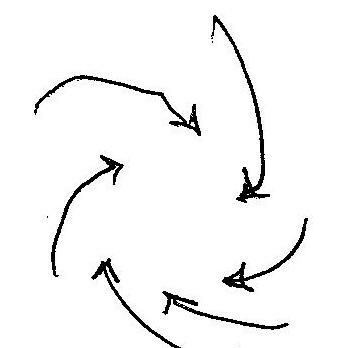 We start spinning because our heart strings are wound tight and we start to spin when the dynamics of lover or situation brings a response from us, and we spins, voluntarily or not. We are not free within physiological systems. We die if our hearts do not beat. These are closed systems. They are self-directed. But, our consciousness and our love, is based on an open system. We can choose to spin, or not. What we a human beings have over closed systems is consciousness. Dynamic Harmony means being conscious of the situation and choosing whether or not to be spun by our heart strings, guilt, passions or other forces. With consciousness comes freedom. And, with freedom comes isolation and loneliness. So, between relationship and isolation, between open systems we can change and closed systems we cannot, we live. This is paradox. This is love – loose and tight. Glen Beck and God on winning. Th3 Simple Questions - Slice Open Everyday Life by Mr. Jean W. Yeager. Honestly I have been in a slump for awhile when it comes to reading books until I got my hands on this one... let's just say this amazing book found me and I am ecstatic that it did. The style of short essays or "slices" each with the "Who am I", "Why am I here", and "What do I want", format took me by surprise as it was an energizing way to read and process thought provoking concepts with each "slice" only being a few pages long and the analogies were artfully presented as real life experiences that most anyone can relate to.